This cookie is great because it is chocolate chip and it is huge. I would compare it in size to a hockey puck. I got the recipe from here at vanilla sugar, but I took out the nuts, added an ounce of chocolate, and also ground some of the chocolate before adding it to the batter. I also changed the brown:white sugar ratios. 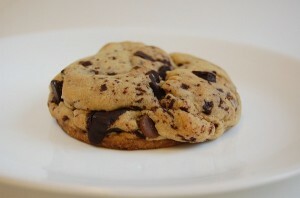 This cookie, and many like it, are an attempt to copy the giant cookie available from Levain Bakery in New York. On the bakery’s home page, it looks like the Levain cookie is slightly darker on the outside and slightly softer on the inside than the ones I have made. Oh well. That can be fixed with modified bake times and temperatures. 1. Beat butter and both sugars until creamy. 2. Add the eggs and the vanilla until combined. 3. Mix flour, salt, baking powder, and baking soda together in a separate bowl, then add this dry mix to the wet mix. 4. Grind up a few ounces of the chocolate until it is in really small bits, much smaller than a regular chip. You should have a variety of sizes of chocolate, some much smaller than regular chocolate chips, some about the same, and a few that are bigger. Add all the chocolate to the batter. Stick the batter in the fridge for 15-30 minutes (optional). 5. Each cookie, when you put it on the pan, should weigh a little over 4 oz,* and you should get a total of 12 cookies, six per pan. Mine were pretty much rolled into balls. I also tried to make sure I covered any exposed chocolate on the bottom of each with more dough, so that the chocolate didn’t melt onto the pan. Baking: Set the oven to 375 degrees. Bake for 8 minutes. Then, without opening the oven door, re-set the oven to 325 degrees and wait 8 more minutes. Take the cookies out and cool on a wire rack. Or, if you are me, stick the pan on top of a pot because you do not own a wire rack. Alternate, Easier Bake Times: Bake at 350 degrees 18-22 minutes until done. I did the first bake method, but if I wanted to go for an even softer inside (though my insides were quite soft) I might try the easier bake method and keep my times closer to the 18 minute mark. I probably will do this, because to me there’s practically no such thing as an underbaked cookie, provided it holds together. *Note: I have since learned that for Levain sized cookies, 6oz is closer to the real deal. You would have to add a bit of bake time to compensate, I would imagine, but then again soft cookies are awesome and these hold together quite well.